February 10: 30 years ago today Rick Benjamin conducted the first rehearsal of a new student group he was organizing at The Juilliard School: “The Paragon Ragtime Orchestra.” We’re delighted to say that the journey has been amazing! And now we look forward to our Anniversary Season and the many more adventures to come. It’s good to see that our new Irving Berlin CD has just been selected as one of the “Top Ten Vocal Albums of 2015” by TALKIN’ BROADWAY – http://www.talkinbroadway.com/page/sound/january2916.html. We’re in pretty good company there too! 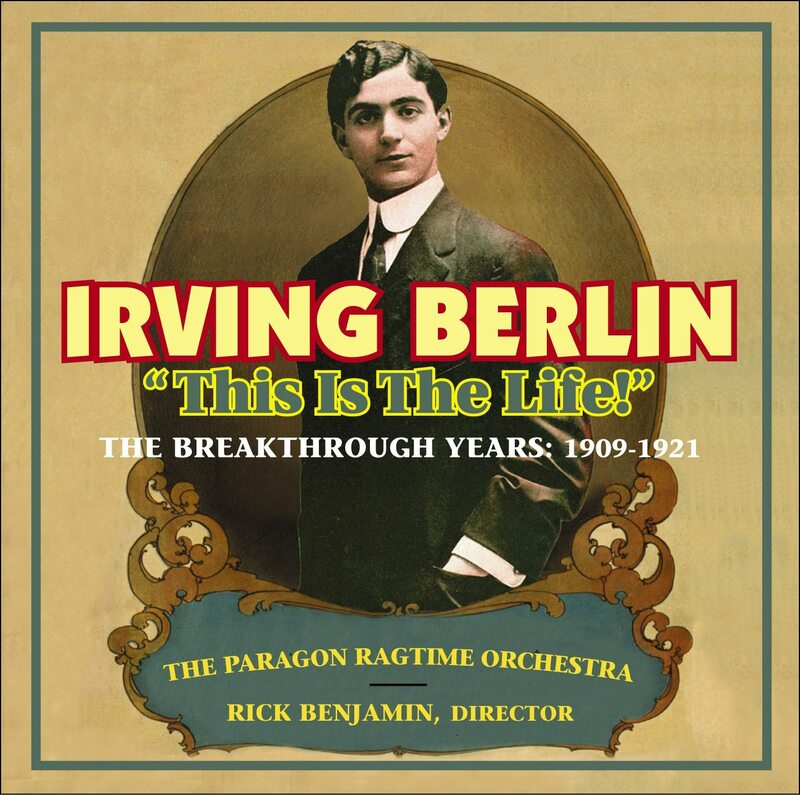 Click here: IRVING BERLIN: THIS IS THE LIFE! for sound clips and more information. Tracks from the Orchestra’s Minding the Score album will be featured every afternoon of the week beginning September 16 over the Bayerischer Rundfunk network on the BR-KLASSIK Mittagsmusik – Thema der Woche program. The host for these shows is Xaver Frühbeis. You can listen online here: http://www.br.de/…/mittagsmus…/thema-harry-l-alford-100.html. The Orchestra is delighted to announce that it has been chosen to receive a 2015 National Endowment for the Arts (NEA) grant for its new touring program Paragon LIVE in Historic American Theaters. 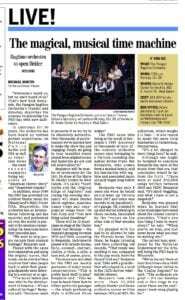 This program, designed by Rick Benjamin, will feature performances of works by American composers from the late 19th and early 20th century presented in pre-1930s historic theaters across the United States. Our sixteenth album! This one shines the spotlight on a seldom heard topic – the birth of movie music. 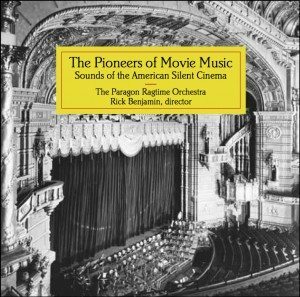 Return to the 1910s and early ’20s to listen as seventeen gifted pioneers develop the art of the “film score.” The album features 74 minutes of rare and delightful music – all played from the original orchestrations – along with a 52-page booklet highlighting the musical evolution of this glamorous era of the cinema. It’s a lost world of sound and a “must” for all classic movie fans and soundtrack buffs! 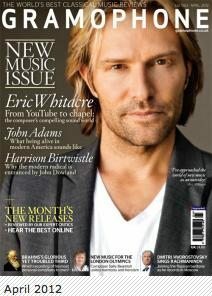 Click here: PIONEERS OF MOVIE MUSIC for sound clips and more information. Narrated by Rick Benjamin, and produced by Arbour Media. PRO’s fifteenth album tributes a true American musical genius – Harry L. Alford (1875-1939). Alford was not only a famous composer (especially of marches), but also a pioneer arranger/orchestrator of unsurpassed brilliance. Harry Alford’s 30,000 (!) scores for band and orchestra were the state of the art in the early the 20th century and formed a basic repertoire heard and enjoyed by millions. 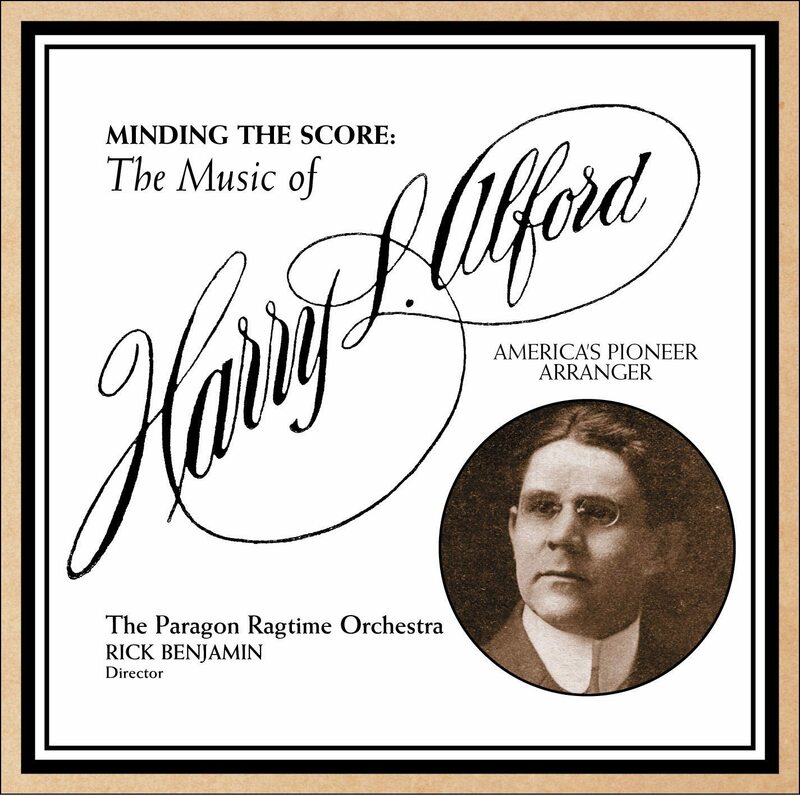 Click here: MINDING THE SCORE: THE MUSIC OF HARRY L. ALFORD for sound clips and more information. PRO’s fourteenth album is the second volume of its tribute to the great African-American composers of late 19th and early 20th century New York City. Again inspired by James Weldon Johnson’s famous book Black Manhattan, this new PRO recording brings to life more of the amazing sounds that profoundly influenced the course of American music. 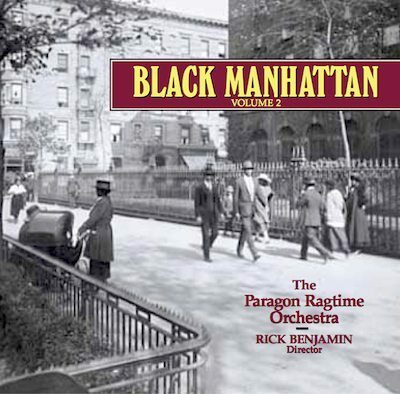 Click here: Black Manhattan Vol. 2 for sound clips and more information. The world’s most prestigious classical music magazine – GRAMOPHONE – has given our new Treemonisha recording its prized “Editor’s Choice” award. 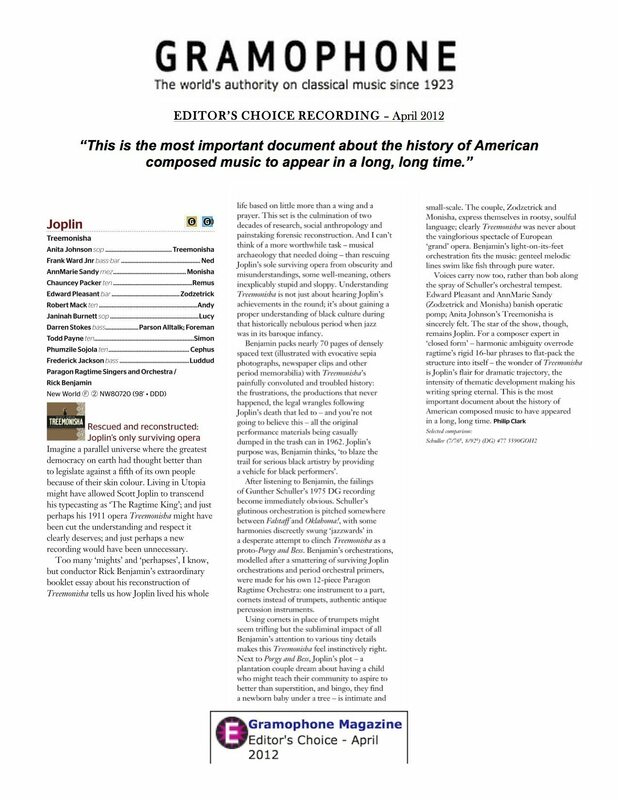 In an astounding rave review, critic Philip Clark declared, “This is the most important document about the history of American composed music to have appeared in a long, long time.” Read the entire article here: PRO Gramophone Review. The world’s largest classical music magazine – BBC MUSIC – has just declared our new Treemonisha their “Opera Recording of the Month.” This is a fantastic honor! 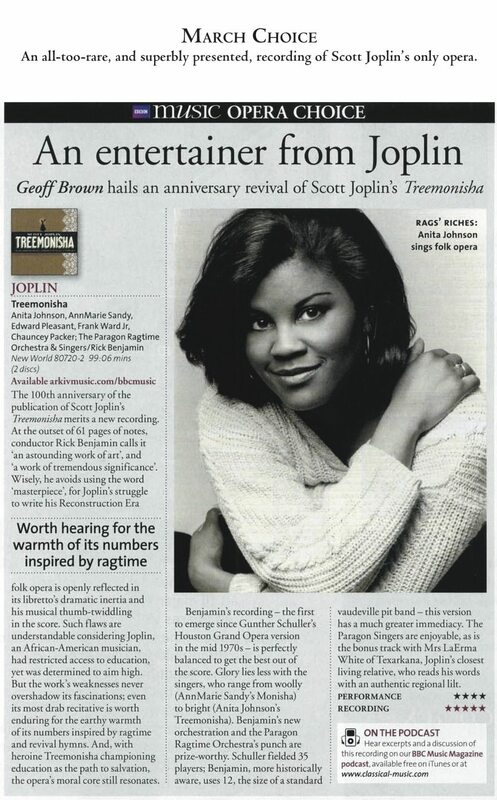 Read the entire article here: An Entertainer from Joplin by critic Geoff Brown. Another major Treemonisha review! 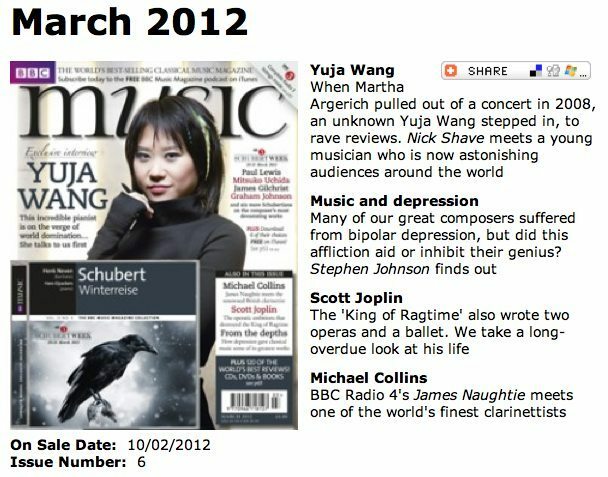 We’re very happy to see the NEW YORKER magazine has picked our recording as one of the top classical releases of the year: “Eleven for 2011” by Russell Platt. PRO’s long-awaited (and requested) recording of Scott Joplin’s opera is now available. 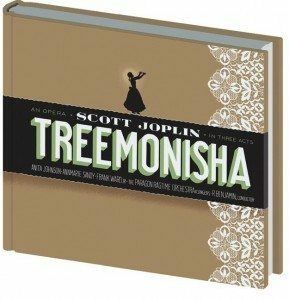 Click here for further information: Treemonisha Recording and Book.